Although it's less likely that your Apple iPhone or iPad will get infected by malware compared to a PC, it doesn't mean they are completely immune, so this list of the best antivirus for iPhone can give you the extra protection you need. Whether it's malicious websites, annoying ads, web trackers or just someone grabbing your device when you're not looking, there's plenty to be concerned about if you own an iPhone. However, many big-name antivirus and security vendors have products that are specially tailored to devices that run Apple's iOS operating system, which is the mobile OS that iPhones and iPads run on. Installing the right app can protect you from both web-based threats and local snoopers, with powerful extras available from cloud backup to high-end identity theft protection. Not all these apps deliver on their promises, but we've found five top-notch iPhone antivirus contenders that definitely deserve a closer look. Keep reading to find out more. German-based Avira is one of the most effective antivirus engines on the desktop, and although Avira Mobile Security doesn't have the same malware-hunting focus, it's still crammed with useful features. Phishing protection does a good job of blocking malicious websites, an excellent first step in keeping you safe online. An Identity Safeguard automatically scans the email addresses of you and your contacts to check whether they've been leaked online, and alerts you to any security breach. An unusually versatile Contacts Backup feature can protect your address book by emailing the details to yourself, or backing them up directly to Google Drive or Dropbox. Elsewhere, handy management tools enable analyzing memory and storage use, as well as providing monitoring reports on recent security events, plus the suite is rounded off with a simple anti-theft module. Put it all together and Avira Mobile Security is a versatile suite which uses multiple layers to protect you from web-based and other dangers. Go grab a copy immediately. Lookout is an unusually complete security app which shields your iDevice with four layers of in-depth protection. Powerful security tools check for common security vulnerabilities (missing updates, a jailbroken device), monitor running apps for suspect activity, and raise an alert if you connect to a dangerous Wi-Fi network. An effective set of anti-theft technologies include various device location tools, an alarm that works even if your device is on silent, and the ability to display a custom message on the lock screen to help you get the device back. Simple backup options are on hand to keep your contacts and photos safe from harm. There’s a lot of functionality here, for sure, but if you want more, the $9.99 (£7.15) a month Premium Plus version adds a full-strength identity theft protection service. This includes alerts if any of your personal information is exposed in a data breach, along with social media monitoring, lost wallet recovery to help you quickly cancel and reorder credit cards, 24/7 support if the worst happens and $1m identity theft insurance to cover any damages or legal fees. McAfee Mobile Security won't exactly surprise you with its functionality. Anti-theft, contacts backup, secure local storage for your media files: it's all very familiar. But don't let that put you off – the app is more interesting than you might think. The Media Vault hides your photos and videos, for instance. That's not unusual, but you can also snap photos or videos directly from the app, and have them automatically encrypted and stored in the vault. And you can quickly reopen the vault with Touch ID or even Face ID on the iPhone X. The anti-theft features take a similarly thorough approach. Yes, there are the standard options to track your device on a map, or activate a remote alarm which sounds even in silent mode. But the bundled CaptureCam feature can email you with a snapshot of anyone trying to get into your vault. You're able to initiate an alarm from your Apple Watch for easier location. The app can even save your device location when the battery is low, giving you a better chance of tracking it down. Bonus features include automatic contacts backup, remote wiping of contacts if your device is stolen, and a battery indicator which allows checking your iPhone battery level on your Apple Watch. McAfee Mobile Security may not have the most imaginative of feature sets, then, but there's a lot here, especially for a free app from a big-name vendor. If you don't have some of these functions already, it's well worth a closer look. 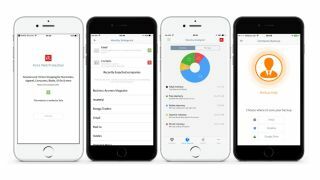 Your iOS devices may not need antivirus software in the traditional sense, but there are plenty of other threats out there online, and Trend Micro Mobile Security tries to combat them all. Built-in web filtering works with Safari and other browsers to prevent you accessing malicious or unwanted websites. Integrated ad and tracker-blocking maintains your privacy while cutting data usage and speeding up website load times. A Social Network Privacy feature scans your Facebook and Twitter account settings and reports on any potential privacy concerns. Trend Micro's Safe Surfing is a secure browser which supports its own private surfing mode, giving you extra reassurance that your history isn't being recorded. A bundled anti-theft feature enables locating missing devices via GPS, Wi-Fi or cell towers. All this functionality comes at a price: $4.99 (£3.50) each month, or $29.99 (£15) for a one-year license, or $49.99 for a two-year license paid up-front. Trend Micro Mobile Security does allow for testing all its premium features via a time-limited trial, though, and even if you don't sign up, the app has a couple of useful free features. The Device Access Status module checks your system to ensure it's configured properly, and a Secure QR Code Scanner provides a safer way to open mystery links. F-Secure SAFE for iOS comes with a custom browser which provides several ways to keep you safe online. This starts with simple web filtering which blocks access to dangerous sites, reducing the chance that you'll run into any malware. And that's important – even if a malicious file can't infect your iPhone, there could be problems if you share that file with anybody else, or perhaps email it to yourself for use on a PC. A simple Banking Protection feature sees F-Secure check each website you visit to confirm it's on the 'trusted' list for banking or shopping online. An indicator shows you F-Secure's safety verdict at a glance. SAFE's parental controls system filters content by category, enforces safe search to keep dubious sites out of search results, and allows you to impose browsing time limits. That's reasonable, but keep in mind that iOS doesn't allow SAFE to restrict use of other browsers or apps. The only way to prevent your kids switching to Safari, instead, is to disable it yourself in iOS (Settings > General > Restrictions). F-Secure SAFE also throws in basic anti-theft features, including a device locator and an alarm. We really do mean 'basic' – there's no remote device locking, wiping or anything similar – but the tools work, and they may well come in useful occasionally.